Personnel from the Maine Forest Service battled a wildfire in Lubec Thursday affecting 205 acres. The effort is expected to continue into Friday. One of three Maine Forest Service helicopters sent to Lubec to fight a wildfire affecting 205 acres. According to Brewer Fire Capt. Chris Dore, 6 acres have burned due to a fire on Thursday in Brewer. There is also minor damage to a home at 173 Wiswell Road and major damage to a shed. BANGOR, Maine — About half a dozen wildfires kept forest rangers and firefighters busy Thursday as the state continued to experience dry and warm conditions. 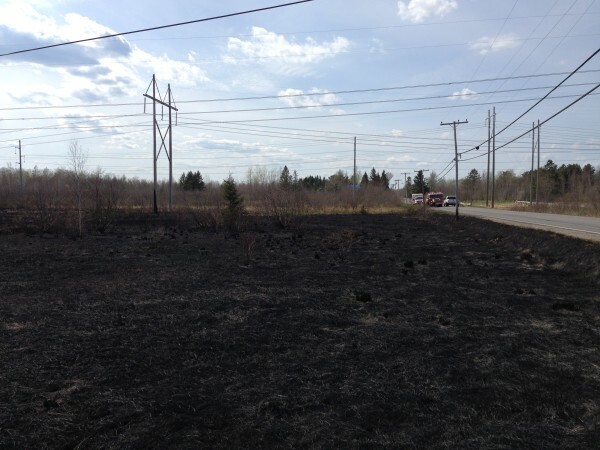 A brush fire on Wiswell Road in Brewer began about 1:30 p.m. Thursday, according to a dispatcher with the Penobscot Regional Communications Center. Another wildfire began about 2:15 p.m. on Hoxie Hill Road in Orrington, an emergency dispatcher confirmed. Both fires were out by 7 p.m., a dispatcher confirmed. Kent Nelson of the Maine Forest Service said early Thursday evening that forest rangers and other fire crews also dealt with wildfires in in Lubec, the town of Penobscot, Lincolnville and Alexander. Nelson said Thursday evening that three forest rangers and one helicopter were working on the Lubec fire, which affected more than 200 acres. He said work to extinguish that fire, located along Boot Cove Road, near Hamilton Cove, is expected to continue into Friday. Nelson said no structures are being threatened. In Lincolnville, a campfire that got out of control early Thursday afternoon led to a fire in the woods and a criminal summons for the man who set it. Lincolnville Fire Chief Ben Hazen said that the wildfire near 11 Ocean Drive, on the Lincolnville-Camden town line, began when a resident was burning material, such as cardboard, books and paper, without a permit. Neighbors noticed the fire grew and called for help. When the Lincolnville Fire Department arrived, firefighters found flames were “quite high in the trees,” Hazen said, and the fire was moving quickly towards the neighbor’s house. Those residents were fighting it with a garden hose. “We were using firetrucks and backpack pumps,” Hazen said. The dozen or so firefighters had the woods fire extinguished in about 20 or 25 minutes, he said. It burned less than half an acre. “It’s very, very dry, extremely dry,” Hazen said. A ranger from the Maine Forest Service came by to check out the scene and ended up issuing summonses to the man in connection with the fire. Kent Nelson, a fire prevention specialist with the Maine Forest Service, said that his agency usually doesn’t release a person’s name until a summons has been filed with a court, in this case the Belfast District Court. Nelson said the Alexander brush fire was caused by a blueberry field burning operating that escaped its intended perimeter by about an acre. After four consecutive “red flag” days, the Maine Forest Service on Thursday urged caution with outdoor fires, Nelson said in a news release. So far, throughout Maine, there have been more than 100 wildfires that have burned more than 100 acres. Most of these fires were caused by people being careless while burning outdoors, he said. Either the fire got away from them or they failed to fully extinguish the fire and it rekindled the next day. Current environmental conditions will allow an escaped fire to spread rapidly and could threaten homes and forested areas. Warm afternoon temperatures, low relative humidity and gusty, dry winds are a recipe for wildfire, Nelson said. Combined with dry, dead grass and fallen branches from last year, it doesn’t take much for a small fire to get out of control. The Maine Forest Service advises people to postpone burning their brush piles or having recreational campfires until the state gets a significant amount of rainfall. Nelson said the wildfire danger report is issued each morning and is a good way to determine whether it’s safe to have an outdoor fire. Visit maine.gov/dacf/mfs/wildfire_danger_report/index.html to sign up to receive the predicted class day via email or text message. Burn permits are also required for burning brush and, in some municipalities, to have a campfire. The Maine Forest Service is part of the Department of Agriculture, Conservation and Forestry. BDN writers Abigail Curtis and Ryan McLaughlin contributed to this report.